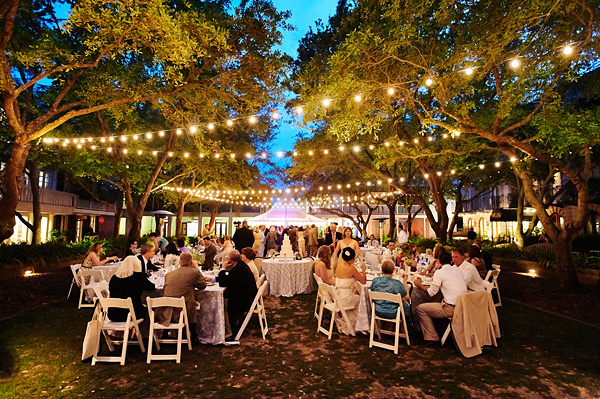 Market string lighting will create an intimate atmosphere at your next event or wedding. String Lights (AKA – Bistro Lights, Twinkle Lights, Globe Lights) provide a simple yet creative way to add ambiance to any event setting! If your event is Indoors, they create wonderful accent lighting. Outdoors, they’re great for decorating gardens, gazebos, tents and more. String lighting can be enhanced with paper lanterns, hanging crystal arrangements and also attaching your current decor! Due to the complex installation of string lights, a walk through at your venue is strongly recommended. During the walk through, we are able to suggest the best route of installation, amount of string lights and rigging required, and lastly the overall design. Our string lighting will illuminate your event space. They also look great in the background for photos and video! How are overhead string lights installed? Our first priority is the safety of your guests while keeping your vision into consideration. String lighting can be suspended from trees, columns, poles, railings and along fences. We use commercial grade hardware to insure proper and safe installation. If the string lighting requires special rigging at your event (determined at the walk through), we will recommend other alternatives. Special rigging is required when there are no trees, columns or safe hanging points at the venue. How Much do Market Lights and String Lighting Cost? During the initial walk through of your venue, we are able to measure out how much string lighting is required or if additional rigging is necessary. General string lighting installations start at $700 (setup & breakdown included). Our Pricing is based off 3-4 hours of labor, distance of string lights, 3-4 lighting technicians on-site, and extra hardware needed (Pipe, Steel Bases, Clamps etc). Please keep in mind the string lights we use are not your typical consumer Christmas lights installed on a home and purchased from your local hardware store. *Enhance with paper lanterns or let us hang your decor from the string lights! Pricing depends on quantity of added decor. Keywords: String Lighting, Market String Lighting, Bistro Lighting, Wedding Lighting, Event Lighting, Las Vegas, San Diego, Orange County, Los Angeles.